Ho Chi Minh City is safe from violence and other issues that plague dangerous cities. That doesn't mean you shouldn't have some tips to avoid ruining your vacation. This article will go into detail about how to stay safe in Ho Chi Minh City! Many of my friends from school asked the question “Is Ho Chi Minh City Safe?”. Many of them are from smaller cities and countryside towns outside of Ho Chi Minh City. So for them to move to the big city was a scary notion that made them wonder about the safety. 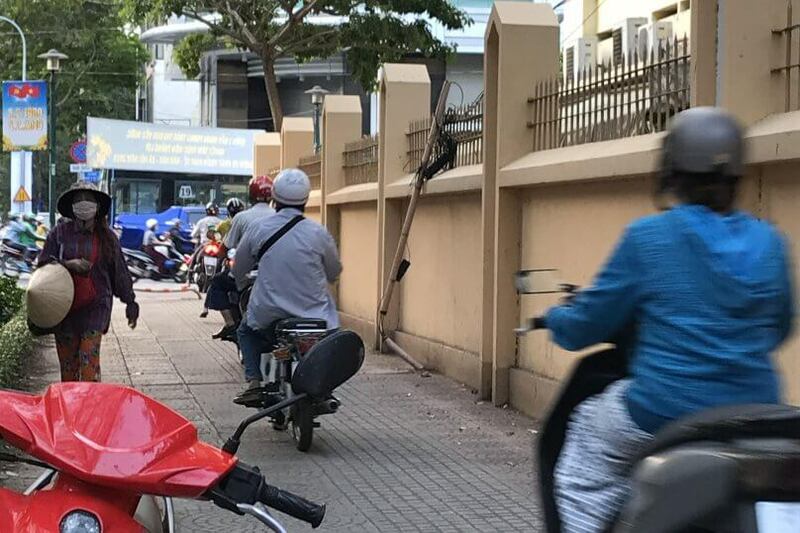 Ho Chi Minh City is like any other big city in the world, you will always want to be aware of your surroundings and watch out for common risks that can be dangerous for not only residents but travelers. Ho Chi Minh City is actually quite safe. Besides some scams and petty thefts, there isn’t much that a traveller will have to worry about if they are traveling wisely. That doesn’t mean you shouldn’t be aware of common safety tips that you wouldn’t know if you weren’t a local or even a frequent world traveler. I’m gonna give you the best tips on how to be on the lookout and to prevent common scams, pickpockets, and robberies. I’ll also let you know about how to stay safe when walking around and also when eating local food. Taking over the sidewalk seems to be a part of the culture of Vietnamese in every major town in Vietnam. The culprits of this encroachment are often food hawkers, shop owners, and motorbike parking for locals. Hawkers bring their goods everywhere to sell for customers whom they meet on the street. When they find a “gold place” where there are many people they will set up shop. This can cause congestion on the sidewalk but many of us accept this as a way of life. We want local food hawkers to be able to make money to support themselves but also provide us with delicious Vietnamese food! Shop Owners also do a similar thing, when it comes to taking up public space on the sidewalks. The shops will often not have a private parking lot for their customers. To meet the demand of customers parking, they turn their storefront sidewalks into parking lots. Consequently, you will see a lot of motorbikes built into long rows on the sidewalk. This again is something that as locals we have been willing to accept because we appreciate being able to park our motorbikes in front of stores when we wish to go shopping. These are the reasons that our sidewalks are always a bit congested and difficult to walk in the more local areas. 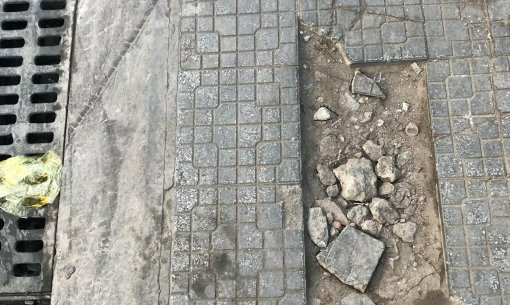 Another point we want to make about walking in Ho Chi Minh City is that the sidewalk is a bit rough and uneven in many places. Be sure to wear nice walking shoes when traveling around during the day so that you can be more steady on your feet when running into unexpected cracks and potholes. Where can I walk safely in Ho Chi Minh City? Government has done a nice job in recent years of keeping the sidewalks in District 1 and 3 clear to allow a better walking experience for travelers. If you are looking at walking around downtown areas, we still recommend wearing comfortable sneakers as some of the pavement is still under construction and a bit uneven. How to Eat Local Food Safely? One of the exciting experiences that anyone traveling to another country has is tasting local food. Vietnamese cuisine is a rich and important part of Vietnamese culture. Ho Chi Minh city has a lot of food hawkers and small local restaurants that serve up great delicious Vietnamese food. This creates an issue when travellers want to eat the local cuisine but aren’t sure how to navigate food vendors to choose the right one in terms of food safety. One common misconception among a lot of travellers is that the locals in a country don’t get sick from dirty food. This couldn’t be further from the truth, we all get sick from dirty food unless you are Superwoman. As a local, we know what to look for in street food hawkers and small restaurants to avoid eating food that could make our stomachs upset. My local tips are using online apps for recommendations, finding stalls who have prepared a lot of food, and eating from crowded places. There are many famous food locations that have many good reviews on food apps like Foody.vn or Tripadvisor. Looking to see how much food a vendor or restaurant has prepared in advance is a safe bet that lots of locals eat there everyday. Another way that is used to identify good quality food stalls is based on the number of guests, the crowded stalls will often be safe. Of course, you can always take a look at our Food Tours here at Back of the Bike Tours if you want to try some delicious and safe Vietnamese food! Any major city in the world that has large amounts of tourism, also has its fair share of scam artists looking to prey on tourists to make some quick money. There is a phrase in Vietnamese “Tay Balo” which means someone who doesn’t know a currency or local prices very well. This is a common phrase used among despicable scam artists that work as taxi drivers or street merchants. Don’t be “Tay Balo” use our guides to learn about Vietnam before coming so that you can understand the local currency and prices before arriving to avoid these types of situations. Dishonest sellers have many ways to deceive foreigners such as raising the price of goods, taking advantage of currency confusion, or using some fraudulent calculations. This is different than your normal bartering that happens at many of the markets in Ho Chi Minh City, which is a fun part of travelling to Asia that many tourists want to experience. We are referring to a vendor who will sell a coconut that costs 30,000 VND ($1.28 usd) for 300,000VND ($12.87 usd). This is outrageous and a true scam but it happens everyday to tourists who do not understand the currency before they travel to Vietnam. To prevent these situations from happening, make sure that you have knowledge of Vietnamese currency and can distinguish the similar banknotes. Is Shopping Safe in Ho Chi Minh City? Yes! Shopping is safe in Ho Chi Minh City and quite fun for a lot of travellers who come here looking for the thrill of the bargain! My suggestion is to do your due diligence before coming so that you have an understanding of what is a fair price for some things. My tips for bargaining is to not pay more than ⅔ of the starting price the vendor offers. Also, always be willing to walk away from the deal! Before famous apps like Grab and Uber, Vietnamese and foreigners in Ho Chi Minh City relied heavily on Taxi Cabs. This led to a lot of Vietnamese and Foreigners being ripped off by illegitimate drivers and companies. Today there are only two companies we recommend when using a taxi cab and those two are Mai Linh and Vina Sun. Even though these are great companies with a decent reputation, things aren’t always perfect so you need to be aware of a few common taxi scams. The first scam would be the classic “drive around” where the taxi will add some distance to the drive by going the long way to get to your destination. You can avoid this by opening up google maps on your phone to be aware of where your driver is taking you. Another Taxi Scam to be aware of would be the broken meter, which means the meter starts moving at a very quick rate of speed. Last but not least, is the luggage highjack. This scam happens if a taxi driver tries to refuse giving luggage back if a customer does not pay the exorbitant amount of money the taxi driver is trying to scam them for. To avoid that type of situation, I never keep my truly important things in luggage that is too far away from me when I get into a taxi. I am sure the feeling when someone steals your possessions without your knowing is really upsetting. It does happen at many places in Ho Chi Minh city, especially in crowded places including Nguyen Hue Walking Street, Bui Vien Walking Street, shopping centers, Ben Thanh market, or public transportation. The pickpockets take advantage of the cramped distance of crowded places to quietly sneak into your pocket, purse, or bag. The rules to remember are to store valuables in a safe at the hotel. Bags and Backpacks should be moved to the front of your chest when in these crowded areas. Do not regularly check the pockets containing important assets, as it’s the way to show the thieves where you are keeping your wallet. Be wary when someone bumps into you or approaches you too closely, thieves often use this trick to approach their prey. Finally, when you take money out of your pocket for payment, do not forget to pay attention to your surroundings. From my perspective, robberies are the most dangerous risk in Ho Chi Minh city. Not only foreign tourists but also Vietnamese residents are often victims of bag or phone snatching by thieves on motorbikes. This only takes a few seconds, you won’t have enough time to react promptly and protect your assets. This can happen anywhere, at any time. Maybe it comes when you’re walking on the road, driving on the motorcycles, getting out of the car or buying something from street vendors. 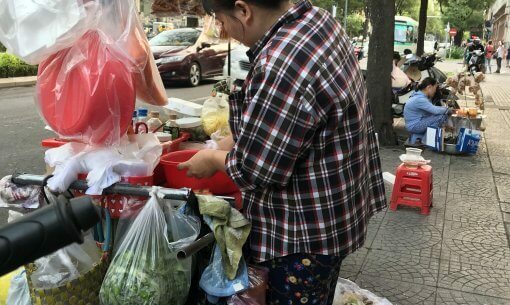 The way Vietnamese people apply to prevent losing property is to avoid using their bag or phone while standing on the street, where bags with a strap across their chest and staying aware of their surroundings. Try to limit using smartphones while traveling on the road when it is not needed. If you need to use your phone, be sure to be away from the street and standing on part of the sidewalk that is not easy to get to for a motorbike. If you have some valuable assets such as watches, necklaces or bracelets, my advice for you is not to bring it with you when traveling to Vietnam. Of course wearing your wedding ring is okay and no cause for alarm but there isn’t anything to gain from bringing fancy jewelry on your vacation to a developing country. Robbers often pay attention to valuable things that catch their attention quickly, so it’s best to avoid putting yourself in this situation. Ho Chi Minh City is Safe and I am happy to call it home. At the end of the day, I have lived in Ho Chi Minh City my whole life and I am proud to be from here. I don’t feel scared or threatened. My country and people are beautiful even if in the big city you always need to be aware and to be careful. If Vietnam is one of the destinations on your travel plan, I think you shouldn’t miss Ho Chi Minh city. It is an interesting place with a unique cultural and culinary richness that you can’t find anywhere else in the world.